Cutting edge special effects in 1982! Actually the FX weren't all that impressive even in 1982, but it was a big step in the right direction, and truly impressive CGI was a couple of years away. Nowadays people complain about CGI and yearn for the old days with models and miniatures. Go figure. The story in Tron was interesting but not very involving. It's hard to get caught up in the fate of virtual people who are actually just the applications on a computer. And the villain was an operating system that endeavored to streamline the computer's functions by eliminating obsolete programs. As for the recent sequel, I can't speak for anybody else, but it presented a story that was . . . worse. I well remember going to see Tron in its initial release,Bud. I was fascinated by the dawn of a new era in visual FX & reading all about this new CGIthingy. 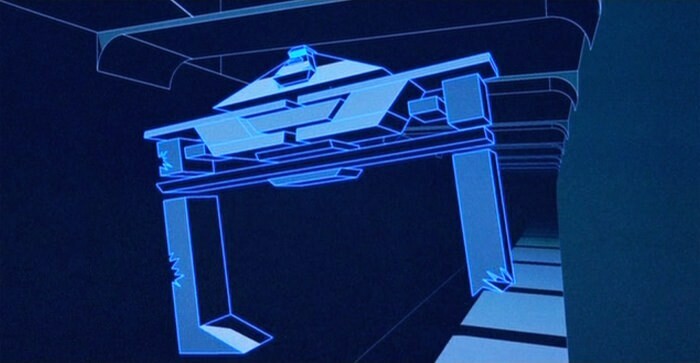 Tron & The Last Starfighter were the first intros employing CGI. T was dazzling to look at, the story was mediocre & only was there to support the FX. Any good or great sf film or tv show has the FX support the well written script. 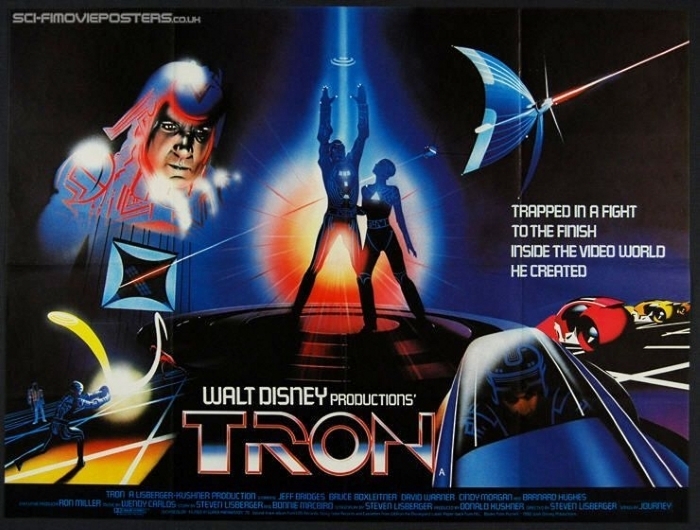 Tron sequel was also astonishing eye candy. Unfortunately the script was equal to the first T film. As is often the case with sci-fi films, Tron's strengths were it's components rather than it's whole. The motorcycle race scene tends to be what viewers retain most about about this one and that scene was a pretty epic piece of sci-fi film history, I think. There wasn't a whole lot beyond that to remember. Some films are like that, though. For some strange reason, I found the movie dark and depressing. It's probably because of the atmosphere in the virtual universe. The motorcycle race scene tends to be what viewers retain most about about this one and that scene was a pretty epic piece of sci-fi film history, I think. I must admit, the light cycles still have a strong appeal, partly because of the great design of the light cyles by Sid Mead (I think). ____________ Tron (1982) - "Light Cycle Battle"
Yeah, the Light Cycles were Syd Mead's. I met him briefly once at a showing of his work here in SF. I was in line with my bud Andy Probert, who's a big fan of his. We've had several spirited debates on All Sci-Fi about the replacement of vintage special effects with CGI versions (like in TOS), but this is a new idea. The older CGI FX in the original Tron being replaced by modern CGI which would be much more impressive. A large part of what flaws the older FX are the visible matte lines which fry and frizzle around the superimposed elements. And even though many of the FX (like the Light Cycles) are impressive, some of the graphics are pretty simple. I wonder how hard (and how expensive) it would be? Would the creators have to start from scratch, or could they just enhance the existing FX? Perhaps it would it be a combination of the two. Well, the trouble is there are only about 9 minutes of actual CGI in the movie. The rest is all airbrushed backgrounds, traditional animation and layers of high contrast black and white photography for the actors and some set pieces, You can't replace the CGI, you have to replace pretty much all the painted backdrops, etc., etc. It's be a helluva lot of work for a very mediocre film. IMDB has 66 trivia items for this movie. Here’s a few of the ones I found the most interesting, in the blue text. ~ The film was disqualified from receiving an Academy Award nomination for special effects, because the Academy felt at the time that using computers was "cheating". Note from me: I don't know what to say about this item except that the Academy apparently didn't know it's ASCII from a hole in the ground. ~ To inspire the actors, arcade games were placed on the production sets and could be played during downtime. Jeff Bridges apparently was the most adept at the games and found it hard to tear himself away from a game to shoot a scene. Note from me: "Hey, Jeff! Get off the game, dammit! We gotta scene to shoot!" "Give me another minute. I'm gettin' inspired." ~ Although the film was an initial failure, the arcade video games based on it proved to be a tremendous hit and actually out-grossed the film. Note from me: It's amazing how far computer graphics have progressed, in both movies and video games. ~ Jeff Bridges produced too much of a bulge in the crotch area in his computer outfit, so he was forced to wear a dance belt to conceal it. Note from me: I'm pretty sure nobody minded the way Cindy Morgan filled her computer outfit. 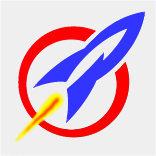 ~ Many Disney animators refused to work on this movie because they feared that computers would put them out of business. In fact, 22 years later Disney closed its hand-drawn animation studio in favor of CGI animation. Hand-drawn animation was ultimately resumed at Disney at the behest of new creative director John Lasseter, also head of Pixar- ironically a computer animation company. Note from me: I respect the animators' decision, but it's unfortunate that they didn't use the opportunity to learn this new way to create animation. 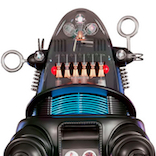 ~ The state-of-the-art computer used for the film's key special effects had only 2MB of memory and 330MB of storage. Note from me: My how time change. My own Toshiba laptop (made in 2011) has 463 GIGAbytes of storage, of which I’ve only used 278. 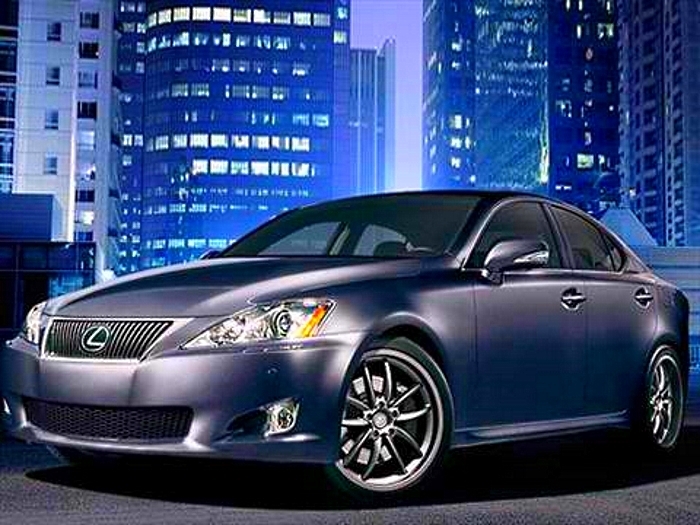 ~ According to Hollywood Treasure: Comic Con-Quest (2010), Cindy Morgan traded her Yori costume for a Lexus. Note from me: My goodness. absolutely beautiful! And the car ain't bad either! ~ Originally released in the summer of 1982, the abysmal return at the box office caused it to be re-released in February 1983, which produced even worse results. Note from me: If at first you don't succeed . . . a second try doesn't always work. ~Those are actual Frisbees that the characters throw around within the game grid. Note from me: The way the glowing disc are used as weapons by the competitors might seem like a level of control that isn't possible in the real world. Think again. 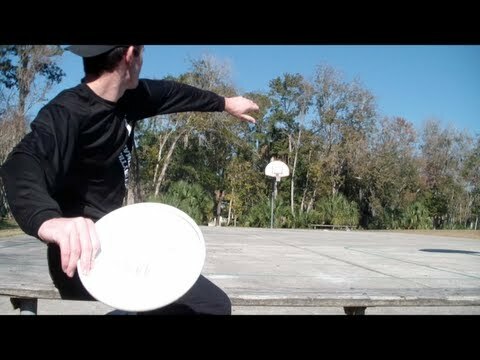 Notice that Frisbee champion Brodie Smith throws the disc exactly like the players in Tron do, not "backhanded" the way I've always done it. Today I was making the post above and I needed a jpeg of Cindy Morgan in her tight computer world outfit, so I did a Google search. Then I tried Youtube clips. 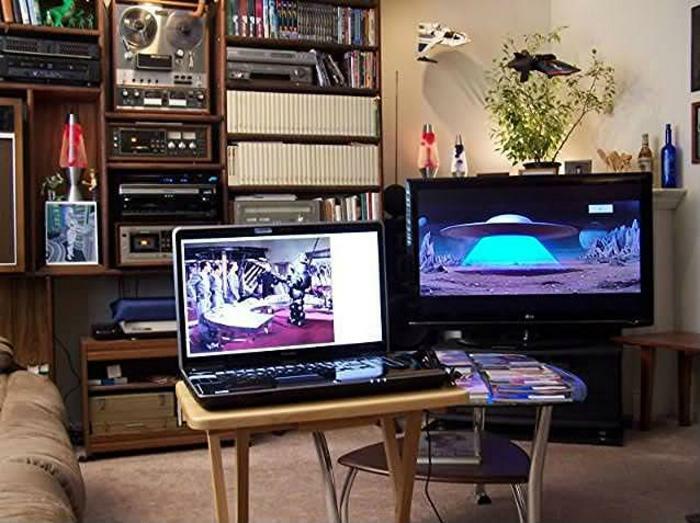 Then I remembered that during my six enjoyable years as the late Bulldogtrekker's friend we downloaded Tron and shared while chatting on Facebook. We did things like almost every day. I discovered that I still had the the beautiful 989 MB download of Tron, so I spent about 30 minutes trying to find a good shot of Miss Morgan. I was frustrated by the fact that there didn't seem to be any, but just as I was about to give up I found a nice moment near the end of the movie that displayed Cindy's shapely figure. Folks, I promise I didn't do a thing to this screen shot to enhance it. The blue outline around Cindy is part of the matting process in the movie, but it's a perfect way to accent her feminine form. On a related note, while fast-forwarding and rewinding back-and-forth through the movie I was pleasantly surprised by the gorgeous eye-candy which represented the movies computer world. Admittedly the story is thin, but it's still visually impressive, especially for an aging artist like me who practically hyperventilates at the sight of gorgeous photography, breathtaking locations, spectacular special effects, stunning matte paintings, and beautifully lit actors whose closeups look like portraits in an art gallery. Maurice, I agree that the CGI in Tron is simplistic by today's standards, but the artists who created the appealing look of the computer world squeezed every ounce out of the technology, using all the methods you named above. To illustrate my point, here's a gallery of images I made from my download. I didn't enhance any of these by boosting the color. This movie presents some awesome images. So that's why I recognize her. Caddyshack! I really didn't like any of the photos from Caddyshack I found today except this one, but it's only fair. I dislike the narrow composition and the poor color. So I went to work with Paint.net and fixed the darn thing! Ah . . . much better. According to Cindy she would have loved to be in the Tron sequel but nobody asked her. It was really cutting edge for its' time, but much like the computer screens in 2002:ASO they couldn't match what became reality. Still, as a document of its' time it was a light trip!